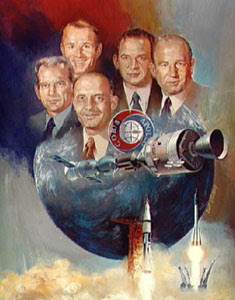 Prior to the Apollo-Soyuz Test Project there were several attempts by the United States to engage the Soviets in a joint space effort. President John F. Kennedy was the first to propose a combining of U.S and Soviet resources. Kennedy’s core focus was defusing tensions between the U.S. and the Soviets by working together on a moon landing. His message to Nikita Khrushchev initially laid out specifics on what cooperation would entail. Khrushchev had initially responded positively, but then added that “cooperation without disarmament” as a precursor would severely limit the extent to which joint sharing of information or joint missions could take place. Kennedy tried once again at a speech to the United Nation shortly before his death asking for joint cooperation between nations on space endeavors, but by the time of Kennedy’s second speech the race between the U.S. and the Soviets was too far along to reset each nation’s strategies. The assassination of John F. Kennedy shortly after the U.N. speech ended any chance for cooperation as fulfilling Kennedy’s moon challenge would be accomplished by the U.S. alone in honor of the fallen President. With Richard Nixon’s election in November of 1968 the course was changing. It can easily be argued that over the history of the space program it has been driven by political concerns and ambitions rather than technical achievements. The Nixon view towards space would be no different. Nixon had fought for the creation of NASA as Eisenhower’s Vice President. Now, NASA would be his political pawn in a chess game of détente with the Soviets. Early in 1969, and at Nixon’s direction, overtures were made to the Soviets to engage in discussions about a joint space effort. With the moon landing not yet achieved, but almost a certainty, the Soviets were in a difficult position that made accepting such overtures a public acceptance of defeat. Ironically, that same year the movie “Marooned” would be released. The movie was a realistic depiction of three American astronauts trapped in an Apollo-like capsule after the service module engine failed to ignite. The movie ends with a Soviet spacecraft changing course and reaching the astronauts and providing assistance until help arrived. That very concept was an original tenet of the Kennedy-Khrushchev proposal back in the early sixties. Marooned was the first movie portrayal of the U.S. and Soviets cooperating in space at a time when the rivalry and hard feelings were at an all time high. It would take persistence by Nixon’s lieutenants and a more receptive Soviet Academy of Science that would finally convince the Soviets to undertake a joint mission and make cooperation in space a reality. The proposal for some type of joint effort came attached to other points of cooperation such as providing the Soviets with lunar rock samples and exchanging weather satellite data. The political deal making by the White House would get NASA caught in what would be the first of many political and budget dramas that would play out for the next forty-years following the moon landing. The Nixon White House had put a stranglehold on the NASA budget and no matter what the directive or mission NASA could not exceed its budget number. Nixon at one point in 1970 had publicly stated that manned spaceflight by the U.S. would come to an end following Apollo 17 and that unmanned missions were to be the preferred choice. Nixon had already cancelled Apollo 18, 19, and 20. NASA had worked furiously to save manned spaceflight and won approval to continue on the basis that their new vehicle, the space shuttle, would be the cheapest route to space. Nixon finally agreed that the shuttle was cheaper than any other solution to carry payloads human or otherwise into space. There were other problems with the continuation of manned space flight in the interim until the new shuttle came on board. NASA was using leftover Apollo hardware for Skylab to keep America in space. NASA had built two “Skylabs”, Skylab I had flown successfully after some initial glitches and was inhabited by three separate crews. NASA’s post-lunar/pre-shuttle plan for space came down to launching a fourth Skylab mission or doing the ASTP project. With budget issues looming large over NASA, the second Skylab workshop would never be launched and was destined to become a museum artifact. While the hardware had already been bought and paid for, the expense of operating Skylab would have delayed the shuttle development. The shuttle and Skylab were intertwined. The planned third launch of the shuttle was to be a rescue mission that would boost Skylab to a higher orbit and provide the station with five more years of usable life, and America with a destination for the shuttle. That mission was planned for 1978, but the shuttle's first launch wouldn't come until 1981. Too late to save Skylab's decaying orbit. In the spirit of détente with the Soviets, Richard Nixon would get the first mission in space between once rival nations. For the Soviets, there was another reason to cooperate with their former rival. Despite their success with the Salyut I space station, their first attempt at docking there failed. The Soviets had a string of prior flights where two and on one occasion three spacecraft executed a rendezvous, but did not dock. It seemed the Soviets had a problem docking two manned spacecraft. The partnership with the U.S. could be a direct benefit to their program. There were other concerns about the ASTP program – the transfer of technology to the Soviets and about missing out on another opportunity to gain more expertise from another Skylab mission were issues that troubled NASA officials and the media. Many had dismissed any technology transfer to the Soviets claiming the Apollo hardware was already obsolete and soon to be replaced with state of the art shuttle hardware. However, Chris Kraft had noted that perhaps the real benefit for the Soviets came from understanding the process and management techniques of NASA. He also noted that the Soviets got an in-depth look at how we build spacecrafts and how we run the program. There was also a sentiment that after the U.S. accomplished the goal of landing on the moon and demonstrated a clear technical superiority that the Soviets were allowed to climb back up on the stage as an equal to the U.S. in space power. The ASTP brought out the complexities of the two nations working together. It would take five years of planning for a mission where the two spacecraft would remain docked together for only two days. The main objective of the mission was to test the docking mechanism and the rendezvous of two spacecraft launched from two different locations using two different vehicles and methodologies for spaceflight. It was a seemingly simple task after Mercury, Gemini, and Apollo, but one that required years of understanding the nuances in detail of each other’s space programs and spacecraft to accomplish. There would be disagreement on whether or not the ASTP was a good use of NASA resources. The mission itself was successful, but nearly ended in tragedy for the three American astronauts when a series of switches that triggered chute deployment were missed on the checklist. The late, manual deployment had caused a leak of toxic fumes into the cabin which nearly killed the astronauts. The astronauts spent two weeks in the hospital recovering after the splashdown. It would have been an unfortunate ending to the Apollo program and an auspicious beginning to U.S – Soviet cooperation if on the last flight of Apollo hardware and the first joint mission between nations that a loss of life would have occurred. Had the astronauts perished it is likely the cause would have been traced to human error, but many conspiracy theorists would have likely blamed sabotage by the Soviets, damage by the Soviet vehicle, a faulty docking mechanism or what many thought to be a flawed mission to begin with. Such a tragedy could have impacted U.S.-Soviet relations in general and certainly would have impacted future cooperation in space. In hindsight, the mission was a technical success, but did not immediately lead to further cooperation in space. It succeeded in providing the U.S. access to the previously secret Soviet space program, but it would take until 1995 before another joint mission would occur with the first docking of the Space Shuttle Atlantis and the Mir space station on June 29, 1995. There would be eleven shuttle missions to Mir and one mission with an American astronaut, Norman Thagard, flying aboard a Soviet craft for the first time. While the ASTP was a valuable PR success, it ultimately benefited the Soviets more than the United States. The Soviets ended up with information related to U.S. thruster technology and retained the docking mechanism as well as the airlock technology. It would take the fall of the Soviet Union and the resulting financial constraints on the Soviet’s that would force their hand in cooperation with the U.S. and would lead to their full partnership in the International Space Station. Eventually, the partnership would take on new meaning as America became reliant on Soviet hardware to ferry American astronauts and supplies the space station as the shuttle program went offline due to two tragedies. The ASTP opened the door for two former rivals to show that nations could cooperate on a successful mission, but once the political card was played by the Nixon White House, the stark reality of the NASA budget remained and follow-up plans for further joint efforts didn’t seem to fit either countries future agenda. I really enjoyed absorbing the history you've laid out. Thanks for researching and presenting it so clearly! I inclination not agree on it. I assume warm-hearted post. Specially the title-deed attracted me to be familiar with the unscathed story.